Throughout the eternal marathon of jailbreaking and counting down the days to get the new software released by the devs, one question rises into many people’s mind. Is the software safe, and how can I compare the file against the source. SHA1 enables you to check the file integrity against the source, so that you are able to make sure the file has not been modified. 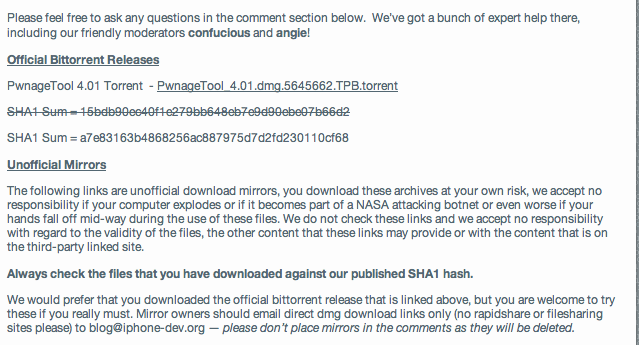 Apple and the iPhone Dev Team uses the SHA1 hash to prove the integrity of their downloads. SHA1 (Secure Hash Algorithm) is a cryptographic hash function created by the well respected Geeks at NSA (National Security Agency). SHA1 is the most widely used hash algorithm today, development of the SHA3 hash is ongoing and expected to be completed by 2012. How Do I Use SHA1 On My Mac? Awesome! In this example, our SHA1 checksums match; therefore, our integrity has not been tampered. What do you think about SHA1, let us know leave a comment! Good explanation here. Many people still use MD5. As you probably know, sha1 is superior to MD5 (less collision prone, etc. ), but still not flawless.